This image from Curiosity’s mast camera shows where the rover aimed two different instruments to study a rock known as ‘Jake Matijevic’. The red dots are where the chemistry and camera (ChemCam) instrument zapped it with its laser on September 21 and September 24, which were the 45th and 48th sol, or Martian day of operations. The circular black and white images were taken by ChemCam to look for the pits produced by the laser. The purple circles indicate where the Alpha Particle X-ray Spectrometer trained its view. When scientists selected a rock to test the Mars rover Curiosity’s laser, they expected it to contain the same minerals as rocks found elsewhere on the Red Planet, but learned instead it was more similar to a rock found on Earth. The rock was chemically more akin to an unusual type of rock found on oceanic islands like Hawaii and St Helena, as well as in continental rift zones like the Rio Grande. “It was a bit of a surprise, what we found with this rock,” Curiosity scientist Ralf Gellert of the University of Guelph in Ontario, Canada, told reporters on a conference call on Thursday. Curiosity arrived on Mars two months ago to learn if the most Earth-like planet in the solar system was suitable for microbial life. Last month, Curiosity’s laser was used to zap the football-sized rock and the rover analysed the pulverised material, as well as tiny pits left behind, to determine its chemical composition. 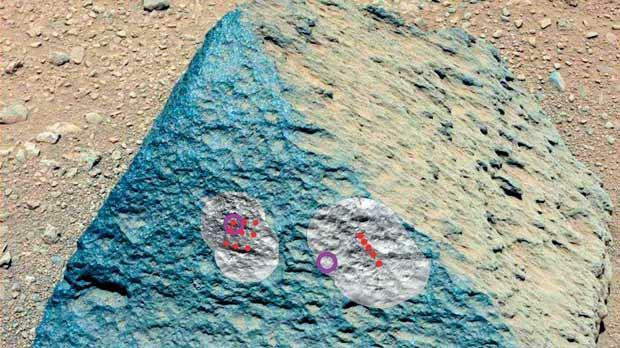 Scientists found the rock lacks magnesium and iron – elements found in igneous rock examined by previous Mars rovers Spirit and Opportunity. The rock, named after a Jet Propulsion Laboratory rover engineer, Jake Matijevic, who died shortly after Curiosity’s landing, was also rich in feldspar-like minerals, which provided clues about the rock’s history. “The way in which this type of rock forms... is like how applejack liquor was made,” geologist Edward Stolper, with the California Institute of Technology in Pasadena, said. In colonial times, hard apple cider was put into big barrels and in the winter the liquid would partly freeze. “You’d crystallise out ice and you’d make more and moreconcentrated apple-flavoured liquor,” Stolper said. Magma inside a planet can undergo a similar process. “You melt the interior and it comes to the surface and, just like the applejack, when you cool it, it crystallises,” Stolper explained, adding that it takes very particular conditions on Earth to produce this type of magma. The rover meanwhile has moved on to testing and cleaning of its soil scoop. Eventually, scientists want to funnel soil samples to Curiosity’s onboard laboratory for more extensive chemical analysis. The rover is part way to its first science target, an area known as Glenelg, which has three different types of rock intersecting.